Largehearted Boy: Book Notes - Margaret Eby "South Toward Home"
Book Notes - Margaret Eby "South Toward Home"
Margaret Eby visited the homes and hometowns of ten southern writers (including William Faulkner, Eudora Welty, and Flannery O'Connor) in her book South Toward Home, which offers refreshing and intelligent insights into the authors, their works, and the American south. "An illuminating journey to the homes, towns, and landscapes that nurtured ten Southern writers…. Eby brings a fine sensibility to her readings…and, in polished prose, offers a fresh look at their lives and literary legacies." 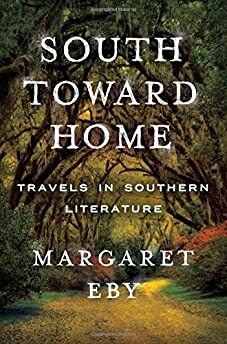 South Toward Home is a literary travelogue, and no travel, particularly around the Deep South, should be done with out a soundtrack. Songs, like novels, are part of the way I understand a place. When I first started bringing my friends from up North on trips through Mississippi and Alabama (on one, famously, each visitor gained five pounds from a steady influx of barbeque ribs and lemon ice-box pie), I made a very on-the-nose mix CD of songs about the South: "Sweet Home Alabama" and "Midnight Train to Georgia," heavy on the schlock-rock and country hymns. As I was researching South Toward Home, traipsing around the South in rental cars and my parents' old Volvo, I listened to that CD again, interspersed with whatever crackling station came through on the FM and AM dial and some tapes I had made in high school that were floating around the glove compartment. When I sat down to write, some of those tunes became my writing playlist, and others I came to through my research. Here is, more or less, the soundtrack to my book. The Jackson in this song might not even be the one in Mississippi—Cash apparently might have been talking about visiting his pal Carl Perkins in Tennessee—but ever since my parents moved to the Mississippi capital, this song has been periodically stuck in my head. While I was tracing Eudora Welty and Richard Wright's steps in Jackson, and mentioned that I was, sometimes friends would start singing the chorus of the song to me: "Yeah I'm going to Jackson/Look out, Jackson town." On one of my first literary pilgrimages with my high school English teacher, a Books, Blues, & BBQ trip, we swang by the house of the late Hill country blues musician Othar Turner to visit with his family, who are carrying on the fife and drum musical tradition Turner was famous for. Turner's family, in Senatobia, Mississippi, throws an annual barbecue where they barbecue an entire goat and invite the neighborhood and beyond to hang out in their backyard while local blues musicians hang out. When I was going up to Oxford, Mississippi, in the hill country for which the blues genre is named, I would play this with the windows down. On my trips to Oxford and the surrounding area to see William Faulkner's house and Barry Hannah and Larry Brown's fishing spot, I would flip on this song, which Dylan wrote about the civil rights activist James Meredith, the first African-American man to enroll in the University of Mississippi. The year that Meredith's entry into the University set off a riot on campus, 1962, was also the year Faulkner died. Flannery O'Connor cribbed the title of her famous short story from this blues song, and so I listened to it on my approach to Andalusia, the farm in Milledgeville where she lived and wrote. I also listened and relistened to the recording of O'Connor reading "A Good Man Is Hard to Find" at Vanderbilt University in her Georgia accent, cracking up the crowd with the voices she assigns each character. I always imagine this—or something like it, perhaps a cut from the Grand Ole Opry—would have been playing in the background in "Good Country People," the Flannery O'Connor story where a Bible salesman steals a woman's wooden leg. It would be just that much more sinister with something cheery and folksy crackling out of an old radio. Harry Crews' fiction is weird, acerbic, and rangey, and made him somewhat of a cult figure in the 80s, if not a novelist as well-known as some of the others in South Toward Home. This gem—equally weird, acerbic, and rangey—is from the band Harry Crews, a short-lived No Wave project from Lydia Lunch and Sonic Youth's Kim Gordon that was named in the author's honor. Their only album was named Naked in Garden Hills after a novel of Crews'. The next time you watch To Kill a Mockingbird, imagine it with a Morricone score. Just kind of fits, doesn't it? Many of the places I traveled for South Toward Home music hotspots, but New Orleans is hard to beat. For my chapter on Confederacy of Dunces, I got to travel on the heels of Ignatius J. Reilly at the beginning of Mardi Gras season, sampling king cake and stopping at the Carousel Bar, which, yes, is a bar on a slowly revolving carousel. Truman Capote, Tennessee Williams, and William Faulkner all drank there. At some point I was listening to Professor Longhair while writing the chapter and realized that the title of the song is the same as the brand of notebooks that Reilly uses to scrawl his thoughts about the precarious state of theology and geometry around him. Whenever I drive down to New Orleans, even if it isn't the route over Lake Pontchartrain, I play this so I can croon along to Lucinda singing, "And the longest bridge/I've ever crossed/over Pontchartain." When I think about Barry Hannah, I think about jazz. It makes sense: He was a jazz fan, and his own prose has the same improvisational quality. Music features prominently in many of Hannah's works (in Geronimo Rex, a character is described as sounding "like Edgar Allen Poe playing the tuba," an image I just love). I don't know if he liked Sun Ra or not, but somewhere in my head I started connecting Sun Ra's intergalactic rhythms with Hannah's feverish, off-kilter prose. After the writer Larry Brown's death, Blood Shot Records put out a collection of songs that reminded them of Brown, "the sort of thing that Larry would have enjoyed listening as he drove his little truck into the gloam with a cooler full of beer." I bought it when I was writing my chapter about Brown and his writing shack in Tula. All the tracks are good, but this one's lolloping, almost menacing pace is perfect. When I close my eyes, I can imagine being there, in a pick-up truck with the windows rolled down, heading somewhere deep in the heart of Mississippi.